The Florida Keys are so unique especially when it comes to fishing. Starting at the Southern tip of Florida sweeping down to the South then to the Southwest separating the Gulf of Mexico from the Atlantic Ocean with a thin stretch of islands. Roughly 800 islands make up the Florida Keys all surrounded by waters filled with life and incredible fishing.. Of all these islands 42 are joined by bridges making up the Overseas Highway or US1 making it easy to drive from Miami, all the way to Key West, the very last connected island. Is easy to see with all the fertile waters surrounding the Florida Keys and Key West why the fishing is Epic. Just about 5 miles offshore is the blue waters of the Gulf Stream in the Atlantic where sport fishing was made famous by names like Hemingway, Gray and Williams. Here we have compiled all the different types of fishing that Key West has to offer and explain them all to help you choose what might be best for you. When we say Key West fishing is versatile, we mean it. Fishing here appeals to most every angler in one form or another. Some folks its an environmental or economic decision. They don’t like rough seas or the offshore fishing charters are just too expensive, so they look to the Backcountry Fishing or flats fishing for calmer and more affordable ways to enjoy a really fun day of fishing. Others don’t mind a little rough and tumble and spending some more money on the larger boats to get out and brave the seas for sport fishing species that the big names such as Hemingway, Gray and Williams made famous. Either way Key West fishing has something for all of the visiting anglers that want to try their hand at catching some really fun sport fish. Let’s file it down another notch. Either way you want to go fishing in Key West A great way to start your research is by checking out our Key West Fishing Report. The Florida Keys made flats fishing famous. With the numerous islands surrounding the area shallows are easy to find. We call them the flats. Holding several different species of fish. Flats fishing is a little bit intense and a can be a technical way to go fishing. A specialized fishing guide and technical flats fishing boat that can cary not more than 2 anglers is required to be successful flats fishing. The popular species targeted are called the “Key West Grand Slam” consisting of the tarpon, permit and bonefish using either a fly rod or light tackle spin fishing rod. Backcountry fishing on board a bay boat in and amongst the islands. Calm, clear peaceful waters. In and among the islands and flats that make up the Florida Keys without going offshore, we consider this the backcountry. 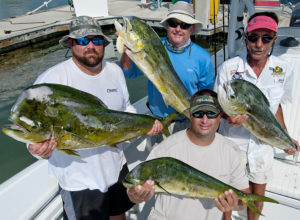 Key West Backcountry fishing is a the most popular fishing charter Key West has to offer. Chosen by more anglers than any other type of fishing due to its relaxed lower pressure nature, affordability, similarity to flats fishing, calm waters, ease of access to the fishery, versatility and its being the best way to go tarpon fishing. The boats are a little larger than a flats fishing boat and can carry up to 4 persons. Key West has incredible deep sea fishing. These anglers have a nice catch of Dolphin. The blue waters of the Gulf stream flows right down the reef line giving each island of the Florida Keys and Key West an easy shot to incredible deep sea fishing. The Key West deep sea fishing fleet has different size boats and amenities to offer the visiting anglers to go out to fit their budget and needs. There are so many incredible opportunities to catch fun fighting sport fish such as dolphin, tuna, sailfish, marlin, kingfish, wahoo and more on a Key West deep sea fishing charter. There are over 45 sunken ship wrecks scattered around the Key West waters in the Gulf of Mexico and the Atlantic. These wrecks hold a multitude of fishing opportunities for the light tackle enthusiast. Often coupled with the reef fishing trips wreck fishing can certainly enhance a day of fishing. All the way from Miami clear out to the Dry Tortugas ( 170 + Miles) lies the only living coral reef in the Northern Hemisphere. Varying in depth from 5 -150 ft of water the reef is the life blood of the Florida Keys and Key West fishing. Corals, ledges and natural structure give many fish homes to live in and prosper giving us as anglers an incredible renewable resource of food fish. 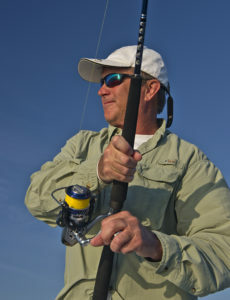 Reef fishing is one of the most popular ways to catch food fish fishing in Key West. Then you can learn about the best seasons to go fishing in Key West you may look over our comprehensive Key West Fishing Seasons page. The cost of fishing in Key West is important. We have a web site dedicated to this. Check out our frequently updated website Key West Fishing Rates to learn more about the costs associated with fishing.